It's been a typical winter so far. Mostly mild temperatures with a day or two of cold fronts each week. Same goes for the winds. Look for windy days most of the week with one or two days when it calms down a little. Water temperatures have dropped this week with the last cold front, but some sunshine will bring it back up to the high sixties. The water has been murky the past several days after the cold front chopped things up a bit. It will clear up fast though. Fishing continues to be good if you are looking for some of the wintertime catch of drum, sheepshead and assorted other fish. We have been catching some big sheepshead lately and you can find them around just about any structure this time of year. Drum will be hanging in the same places. Look for croakers around deeper cuts of the area. Snook fishing around the bridges and jetties has held up nicely for night anglers. We have been getting some nice trout in the deeper cuts on the river this week. Ron, Mike and Ray found a couple nice over 18". 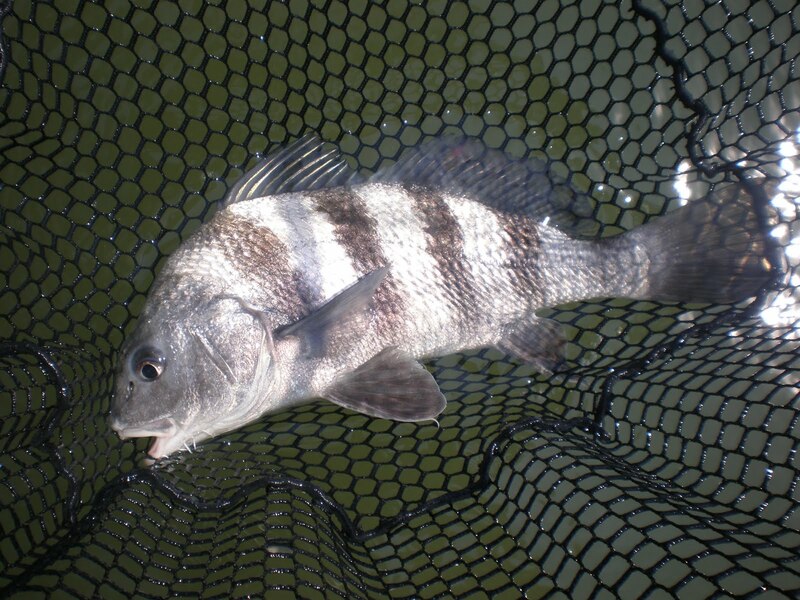 Al and Ryan found lots of sheepshead on their fishing adventure. Jacks are insane right now. It's hard to catch the other fish when they are tearing up the place, but they are fun. It's important this time of year to dress in layers. With cold mornings and warm afternoons, you need to be able to cope with the temperatures and layering makes it easy to deal with. Don't forget sunscreen! It's easy to forget in winter, but you can get sun damage easily this time of year!